Welcome to Snowbird Farms. 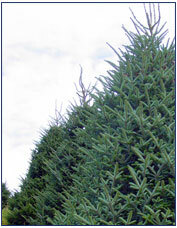 We are growers of premium North Carolina Fraser Fir Christmas Trees. The farm is located approximately 1 hour southwest of Asheville in Cashiers, North Carolina. Snowbird Farms has been distributing Fraser Fir Christmas trees for over 40 years. Our Fraser Firs are raised from seed at 4500 feet elevation. They are pyramid shaped and in the natural environment they can reach a maximum height of 80 feet. Indigenous to the southern Appalachian Mountains, the cool weather and abundant rainfall are idea for their production. The Fraser Fir is known as the Cadillac of Christmas trees because of its needle retention and strong boughs. Christmas-lovers all over have made the Fraser Fir a permanent part of their family traditions. If you have questions or would like more information, please contact us 828-743-5329, 1-800-511-6404, email us, or use our online request form.